Did You Know, On the road the Hagenbeck-Wallace Circus collected large amounts of silver and currency. To prevent it from being stolen owner Ben Wallace shipped it back to Peru, IN., in barrels labeled nails. The banks were unwilling to handle these large amounts so Ben organized a new bank to handle the transactions the "Wabash Valley Trust" (later named the Wabash Valley Bank). The third floor of the building was used for making circus circus wardrobe. During those days in America, traveling shows were often the main source of entertainment in small towns, and crcuses were a common sight. Wallace determined to make his show, though, something to remember. No flea-bitten animals and sloppy performers for him. He chose performers from many entertainment troupes, promising them decent pay, good food, adventure and excitement. He called his show Wallace and Co.'s Great World Menagerie, Grand International Mardi Gras, Highway Holiday Hidalgo and Alliance of Novelties. Much advertised beforehand, the day began with a large parade, led by Peru's own brass band. An estimated 5,000 people viewed the parade, and attendance at the matinee and evening performance was packed. About 300 people were turned away. circusAware of his limited knowledge of circuses, Wallace chose as his first partners experienced circus men, Al Fields and James Anderson. And although new to the profession, he quickly built a reputation for excellence. The famous Bandwagon magazine had this to say about his circus: "This is no little mud show. It's excellent, has a long list of performers and good equipment." Advertised as "high-class" shows, his circus was known for its exquisite horses, excellent performers and beautifully carved wagons, which were still constructed by the Sullivan & Eagle company. Wallace maintained his circus winter quarters in Peru, which encouraged other local industrial and business enterprises. He had purchased hundreds of acres of land southeast of Peru, between the Mississinewa and Wabash rivers, which became the famous winterquarters. The land was once owned by Miami Indians. When the show returned for the winter, many performers came with it. Local carpenters, painters, wood carvers and seamstresses were employed at the winter quarters to keep the equipment in first-class condition. Wallace built a row of houses along the Wabash River, just east of Benton Street, for his working men. The houses were identical and were painted yellow. Today, that area goes by the address Wallace Row. By that time, Peruvians had become used to that unusual group called "circus people" and the sight of exotic animals being marched down Broadway. Events that in other towns were undreamed of were almost commonplace in Peru - for example, the occasional wanderlust of elephants at the winterquarters. The opportunity usually came when the animals were bathing in the river. Word spread quickly and children were kept inside until the wanderer was located, which usually was not too hard to do. The animals usually caused little more damaged than a trampled flower bed, and gave occasion to some humorous stories. 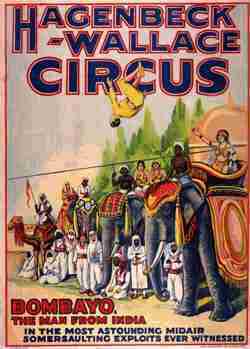 In 1907 Wallace purchased the Carl Hagenbeck Circus and renamed it Hagenbeck-Wallace. It was advertised as the "world's highest class circus," and was one of the top two or three circuses in the world. The only other shows equal in magnitude were Ringling Bros. And Barnum & Bailey. According to a Peru newspaper article on Nov. 29, 1907, the Hagenbeck-Wallace shows were owned by Ben Wallace and John Talbot, with Wallace buying out the interests of three other owners a total of $125,000 for their holdings. The paper reported, "Their show belongs to the class of the greatest tent enterprises in the world and now since Mr. Wallace owns most of the stock his holdings are greater than those of any other showman in the country and probably the world." 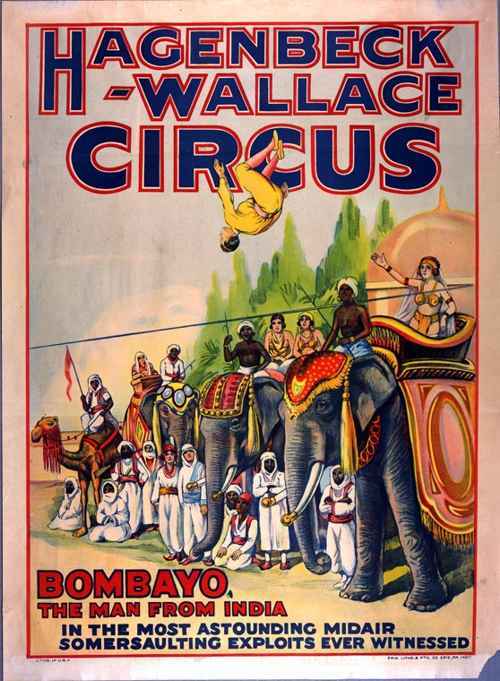 Wallace didn't limit his business to circuses, however. He was also president of the Wabash Valley Trust Company and was a stockholder in numerous other ventures. When he died in 1921, he was the owner of nearly 2,700 acres of land and was one of the largest farmers and stock feeders in northern Indiana. When the Hagenbeck-Wallace Circus left Peru for the 1914 season, it didn't return for 10 years. The winterquarters, however, remained busy, used by many circuses, including Sells-Floto, Howes Great London Shows and the John Robinson Famous Shows. Jerry Mugivan, who had been with Wallace, and Bert Bowers rented the winterquarters for Howes Great London and Robinson's Famous Shows in 1914-15. No circuses wintered in Peru in 1915-17, but Mugivan and Bowers purchased the Hagenbeck-Wallace Circus in 1918, sending it to West Baden to winter, but their third circus, Howes Great London Shows, left on its spring tour from the Peru winterquarters.